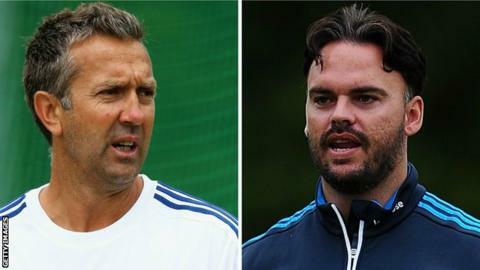 The England and Wales Cricket Board has named Ross Hunter and Ian Salisbury as England's first ever full-time disability cricket coaches. Ex-England international Salisbury has been appointed as new head coach of England's physical disability team. Hunter will continue his work as coach of England's visually impaired side, now in a full-time capacity. The ECB's head of disability cricket Ian Martin said: "This is an important step change in disability cricket." He added: "I'm proud that we are the first international cricket board to make such a step. "It will increase the capacity of our coaches to work with performance squads and is further evidence of the improvement and culture shift within our national squads." Hunter recently led the England's visually impaired side to the semi-finals of the Blind World Cup in India, where they lost to Pakistan. Salisbury's first assignment will be to prepare England's physical disability squad for games this summer as the side continues to build towards a world tournament in England in 2019. "I am very humbled and honoured, especially knowing that we are the first two coaches in the world to be working full-time in disability cricket," he said. "This will create an environment that puts this team at the forefront of disability cricket in England and the world."